My bridges start with the first bridge you go under in Central London as you make your way upstream. 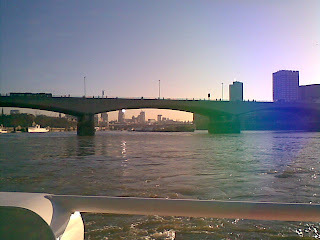 The unprepossessing London Bridge (often confused with it's more colourful Eastern neighbour) is at least the fourth bridge to cross the Thames in that position - and is the oldest crossing point in the central part of the city. The Romans and then the Saxons had bridges here. Then came the famous medieval bridge, lined with buildings (even a church) and also the grisly habit of sticking traitors heads on pikes at the gatehouses. That bridge stood for over 600 years. Its stone replacement in the 19th Century lasted just over a hundred years. It slow subsidence into the river necessitated its replacement and it was sold and shipped piece by piece and reassembled at Lake Havasu City, Arizona. The latest bridge was completed in 1972 (and doesn't it look like it was), and is a busy conduit of both traffic and commuters from London Bridge station on the south side to the City on the north side. One of the 'rights' of Freemen of the City of London is to drive their sheep over the Bridge - it was actually any livestock and the right was not to drive the animals but to not pay the resulting toll; sheep were most valuable - and hence the half remembered 'right'. As a Freeman of the City, at the 800 year anniversary of the mediaeval bridge I took the opportunity to lead my sheep on the bridge. It was a cold, wet day, memorable for the recalcitrant sheep and the smell of wet sheep (and dog).